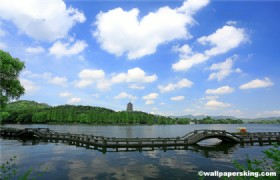 Qinghefang Ancient Street is a 460 meters long walking street which is near to Wu Hill and the West Lake. 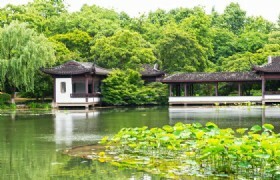 First built in Southern Song Dynasty and became prosperous in the Qing Dynasty.Most buildings were built during the Ming and Qing dynasties,including the luxurious residence and prosperous restaurants, teahouse and stores. 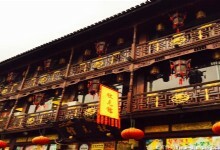 It is a street reflecting the traditional Chinese business culture, construction culture and folk art culture.There are former residences of celebrities, old alleys, ancient houses and renowned store in the street.The rich historical and cultural heritage is the epitome of Hanghzou history. Nowadays, Qinghefang Ancient Street has been one of the famous attractions.Vistors can enjoy the delicious local food,buy local specialties and have entertainments in Qinghefang Ancient Street.The hilarious gatherings and the folk festivals are held at Qinghefang Ancient Street. You cannot miss the famous old shops gathered on this ancient street, such as Wang Xing Ji Fan Store, Zhang Xiao Quan Scissors, Wanlong Ham Stack, Hu Qing Yu Hall, Bao He Hall, Zhuang Yuan House, Wang Run Xing, Yi Yuan Jin Dian, Jing Yang Guan, Sheep Soup Restaurant.